Osteoporosis is a disease that causes bones to become brittle and more likely to fracture (break). With osteoporosis, the bones lose density. Bone density is the amount of bone tissue that is in your bones. Your doctor may prescribe certain medicines to help lower your risk of fractures. These medicines make the bones in your hips, spine, and other areas less likely to break. A bone density test shows you have osteoporosis, even if you have not had a fracture before, but your fracture risk is high. You have a bone fracture, and a bone density test shows you have thinner than normal bones, but not osteoporosis. You have a bone fracture that occurs without any significant injury. Bisphosphonates are the main medicines that are used to both prevent and treat bone loss. They are most often taken by mouth. You may take a pill either once a week or once a month. You also may get bisphosphonates through a vein (IV). Most often this is done once or twice a year. Take them on an empty stomach in the morning with 6 to 8 ounces (oz), or 177 to 236 milliliters (mL), of plain water (not carbonated water or juice). After taking the pill, remain sitting or standing for at least 30 minutes. DO NOT eat or drink for at least 30 to 60 minutes. Your doctor may have you stop taking this medicine after about 5 years. Doing so decreases the risk of certain side effects. This is called a drug holiday. Raloxifene (Evista) may also be used to prevent and treat osteoporosis. It can reduce the risk of spinal fractures, but not other types of fractures. The most serious side effect is a very small risk of blood clots in the leg veins or in the lungs. This drug may also help decrease the risk of heart disease and breast cancer. Other selective estrogen receptor modulators (SERMs) are also used to treat osteoporosis. Is given as an injection every 6 months. May increase bone density more than bisphosphonates. Is generally not a first-line treatment. May not be a good choice for people who have weak immune systems or who take medicines that affect the immune system. May increase bone density and decrease the risk for fractures. Is given as an injection underneath the skin at home, often every day. Does not seem to have severe long-term side effects, but may cause nausea, dizziness, or leg cramps. Is very effective in preventing and treating osteoporosis. Was the most commonly used osteoporosis medication for many years. Its use decreased because of concern that this medicine caused heart disease, breast cancer, and blood clots. Is still a good option for many younger women (50 to 60 years old). If a woman is taking estrogen already, she and her doctor must discuss the risks and benefits of doing so. This medicine is given as daily shots under the skin. Your doctor or nurse will teach you how to give yourself these shots at home. Parathyroid hormone works better if you have never taken bisphosphonates. Is sometimes used after a bone fracture because it decreases bone pain. Is much less effective than bisphosphonates. Comes as a nasal spray or an injection. 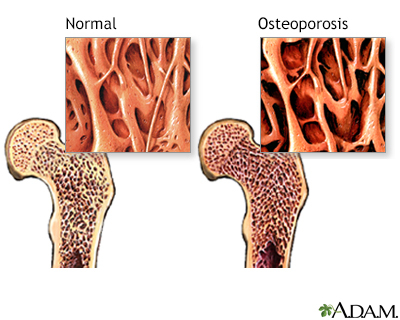 The bone disease osteoporosis is caused by more bone cells being resorbed than being deposited. This imbalance results in a progressive loss of bone density and a thinning of bone tissue. Osteoporotic bones are more porous and therefore more vulnerable to fracture.